At Cheerhome, we’re always thinking about tips and tricks that can help you out and become a more successful cheerleader. 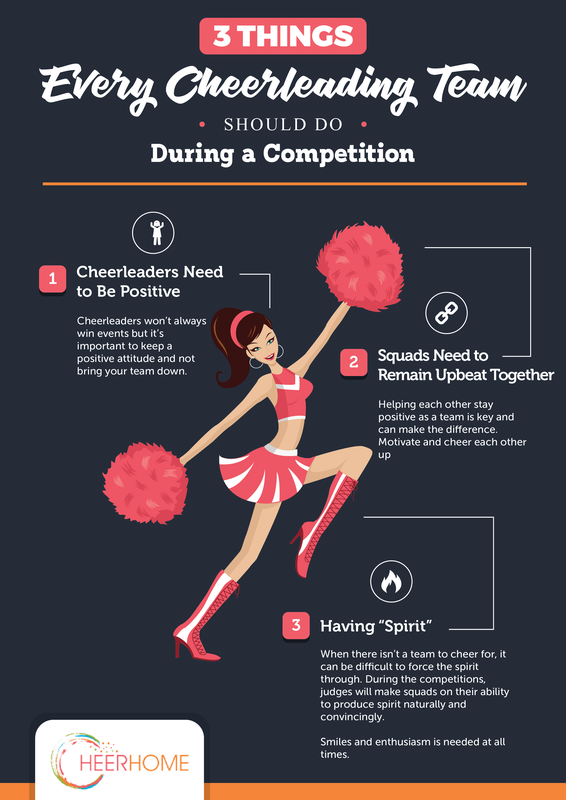 To that end, we remembered how stressful cheerleading events and competitions can be and decided to put together our top 3 things every cheerleading team should during competitions. Check it out and let us know what you think! Cheerleaders won’t always win events but it’s important to keep a positive attitude and not bring your team down. Helping each other stay positive as a team is important and can make the difference. Motivate and cheer each other up and . 3. Having “Spirit”.When there isn’t a team to cheer for, it can be difficult to force the spirit through. During the national competitions, judges will make squads on their ability to produce spirit naturally and convincingly.Smiles and enthusiasm is needed at all times.